A short distance from Lampang, set amid farms and rice fields, is Wat Chedi Sao. The name literally means "the Temple of Twenty Chedis" and one look at the 20 pagodas in the temple courtyard makes it easy to understand the origin of the name. The origin of the temple itself is less clear. A legend recounted at the temple says that two monks from India came to the area about 2,000 years ago to spread the teachings of Buddha. A local prince was much impressed and asked each of the monks for ten hairs. He then built the temple, placing one hair in each pagoda. Some time later, two brothers dug two wells to honor the two monks. Both wells filled with clear water, and can still be seen in the grounds of the temple today. Statues of mythical gods and creatures are dotted around the pagoda, including beasts from both Chinese and Hindu legends. 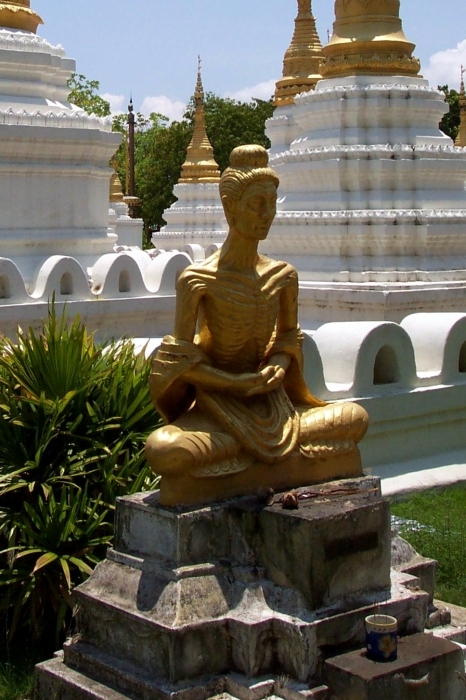 There are also Buddha images in many different styles, including the rare 'emaciated' Buddha shown at right. Behind the chedis is a small two story museum. The upper floor displays artifacts recovered in and around the temple. The lower floor contains many things donated to the temple for monk's use over the years, and includes old fashioned bicycles, 16mm movies, old phonograph records and, gathering dust in the back, an old Macintosh Plus computer. Behind the temple's main hall is a smaller richly decorated wiharn (chapel) that contains a much revered Buddha image. The fifteenth century cast image was discovered by a farmer in his rice field in 1983 and is said to contain the skull of the Lord Buddha in its head. The temple is located about three kilometers northeast of town. A visit is usually included in day trips from Chiang Mai. If you're in Lampang on your own, you can take a samlor.